The V&A Dundee opens this weekend. 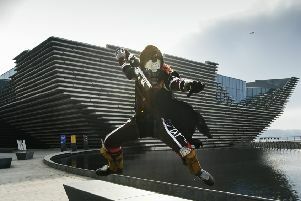 A special preview of the new V&A in Dundee is to take place ahead of its official opening. The £80.1 million building, designed by Kengo Kuma, will open its doors on Saturday and museum bosses anticipate a large number of visitors. However, members of the media and invited guests will be allowed inside its doors on Wednesday. They will be given a preview of the collections and exhibits housed inside. More than 10,000 people are expected to attend an event at the museum on Friday, with thousands more visiting on Saturday for a family-based festival along the waterfront. Entry over the opening weekend is reserved for those who have pre-booked tickets.